One of the hardest things about doing the Autoimmune Paleo (AIP) diet is breakfast. No eggs, grain-based or nut-based porridges, heck even chia seed pudding is out. This doesn’t leave a ton of options that aren’t time-consuming and involved, and typically the ones that aren’t are either soups or leftovers from dinner. Don’t get me wrong, I eat a TON of soups and leftovers while on AIP, but sometimes you just want something that resembles what you know – a comforting and almost fun option. Bonus for it being simple to make, easy to make ahead of time, and portable! If you’re a visual person (like I am) watch the video on how to make an AIP Pumpkin Pie Coconut Parfait and then come back to get the recipe below! In the video, I mention a few important things. The coconut milk I use is Native Forest Simple Coconut Milk as it doesn’t have guar gum (which is not AIP-compliant). There are a few other brands that have guar gum-free coconut milk but this one is easily attained. I also use canned pumpkin to make this super simple. You can use a pumpkin that you roasted and then pureed as well. If you use canned pumpkin make sure the ingredients are only something like “pumpkin puree” and don’t include any non-compliant ingredients. I mention in both the video and the recipe that it’s up to you on how much gelatin you want to use. If you use only a teaspoon per can of coconut milk you’ll get a runnier mixture that is closer to what you expect of yogurt. However, if you use a tablespoon of gelatin you’ll get a very solid mixture. There is no “right or wrong” when it comes to which one you make – it’s totally up to you. I sometimes want it to be closer to the yogurt-type if I want a yogurt-y meal. But sometimes I really just want that “chew” of eating something more solid, in which case I use a tablespoon of gelatin. Once you heat the mixture it’s best to pour it into either a quart-sized glass Ball jar or into a medium-sized Pyrex container to set. You’ll also want to make sure you let this sit in the fridge for at least 4 hours after heating it up to get to the right consistency. If you need a portable breakfast and are taking it to go, I recommend either dishing out the set mixture into half-pint sized glass Ball jars or small Pyrex containers. If eating it at home you can just use a bowl or whatever you have on hand. 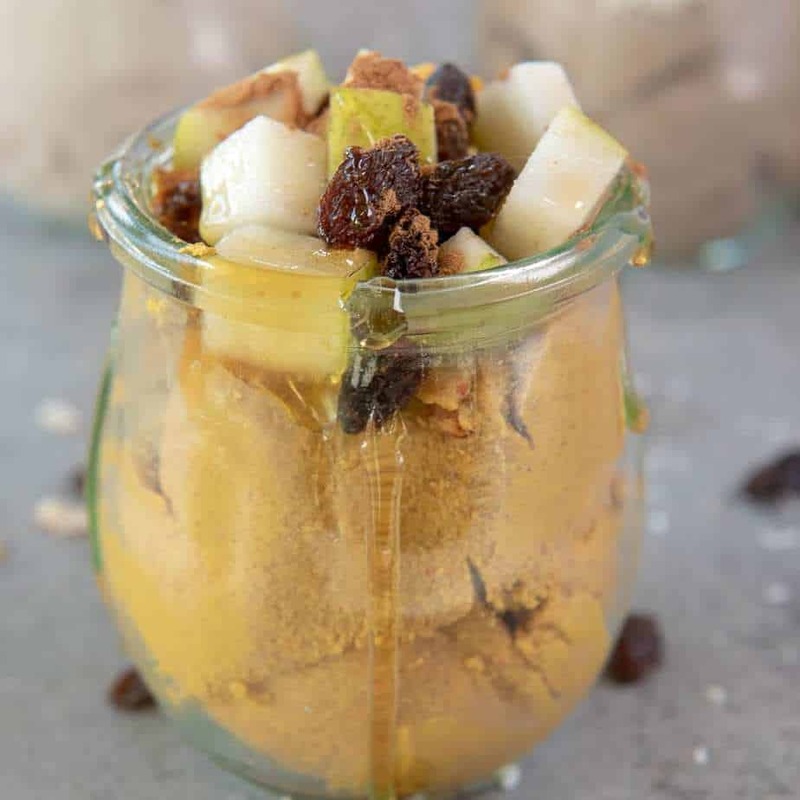 In the video, I topped my parfait with sauteed diced apples, raisins, and a drizzle of honey. I simply diced half of an apple, heated a frying pan over medium heat, added about a teaspoon of coconut oil, let it melt, and then added the apples. Then I added 1 teaspoon of cinnamon and a pinch of sea salt and tossed to combine. I let the mixture cook for about 7 minutes, stirring occasionally. (This topped 2 parfaits – so if you want to top 4, use the entire apple). Then I put the apples, raisins, and honey on the parfaits. I also made a version (seen below) that used diced pears, raisins, a dash of cinnamon, and a drizzle of honey. On this version I did not sautee the pears – they were just diced and placed directly onto the parfait. I recommend that if you’re going to do this and serve it any time other than immediately that you toss the pears with a mixture of some lemon juice and water to prevent browning. A simple Autoimmune Paleo (AIP) breakfast recipe that is egg-free, dairy-free, and easy to make. You can make this ahead of time and then either eat it at home on a busy morning or take it with you as it’s highly portable. Whisk all of the ingredients together in a sauce pan. Heat until hot to the touch. Pour into a glass container and refrigerate for at least 4 hours. Want more ideas for these parfaits? I have a bunch more inside my membership site, the Autoimmune Collective! Variations include: Berry Cinnamon, Carrot Cake, “Chocolate” Banana, Mango Kiwi, Golden Milk, and Vanilla. So delicious and fun! Check out The Autoimmune Collective here!